The Ancient Stone Shrine and the Forgotten Pyramid and The Ancient Stone Arrangements from "Around the Next Bend"
A little over two months ago Trina Barnes made contact with us. She was aware of both the rigour and radical nature of our research, and invited us to join her on site. Trina was adamant she had seen remains of some structures of considerable antiquity, but we have to be honest in stating that this is a common occurrence. Other people have approached us with tales of amazing archaeology and more often than not the evidence was far from convincing at best, and often less. Nevertheless, we sensed a real passion and conviction in delivery which was difficult to ignore and left us predisposed to at least investigate a little further. The photographs she sent us certainly strengthened her case, as some of the rocks appeared to be shaped and formed in a way that looked decidedly artificial. Even so we had discovered through experience and at some expense, photographs can be deceptive and until walking on site everything remained in suspension. Situated hundreds of kilometers from home-base in the south-eastern section of Queensland, we decided to accept the invitation and see what eventuated. The following two articles chronicle what took place once we set foot on Original country of which we knew little. It is merely an introduction and until we can sit and talk with the appropriate Elders and Custodians of Original Lore and Law, all we can claim with confidence is that the artefacts, relics and constructions we have seen are not part of any mainstream curriculum, text or syllabus. Undoubtedly, our team returned from this expedition with a negative score card. Of the six Tribe members that went in, only two came out unscathed. As Ryan rightly commented later, “you have done worse”. I do pride myself on bringing people back in tact and at least semi-upright, but as for being undamaged, I can guarantee nothing on my watch. At the end of the day, only Ryan and Evan emerged uncut, unbruised and none the worse for wear. Bev’s fall was unseen by others, and while made no complaint, it was obvious that one error in foot placement led to her taking up an unplanned residence under some palms and waiting for us to return. Mal hurt her ankle on the way back but carried (and hobbled) on, making sure she kept up despite the pain and inconvenience. Adam, our bare-footed empath who walked his own path somewhere up the front, cut his foot on the coarse quartz encrusted granite rocks that make up the creek-bed and 90% of the route we took. And I managed a very encouraging ‘bleed’ on my hand. I always cut myself on country and invariably shed a drop or two of blood. And if blood is a sign of things to come, this was indeed an unusually good omen. Our main guide, Trina, moved as easily as Adam and was just as in tune with the unsteady lay of the stones that formed the creek bed. Watching her navigate the difficult bushland, it soon became obvious she wasn’t just the guardians of the ancient treasure that awaited us somewhere around the “next bend”, she was meant to be so. As is so often the case, the land had clearly chosen her. Negotiating a safe path through the rocks was a challenging proposition, each and every step was without exception a difficult task and the terrain unforgiving if a poor choice was made. From a distance the party was so strewn out it would seem keeping everyone together was more difficult than herding cats. Trina and Tina were always ahead and kindly slackened the pace so that the gap didn’t become embarrassing, while Adam was somewhere further up, resting and waiting for us to catch up before moving further on yet remaining within sight. It took about an hour before we reached the first of two sites, and despite our difficulties, it would be fair to say we had barely covered a kilometer (0.6 miles) as the crow flies. The scenery was certainly turning tropical. Despite its inland location, the vegetation, elevation and high peaks created conditions that meant this area receives the highest rainfall in the area. At the part of the creek that I first noticed a ‘greener tinge’ in the vegetation, we came upon the first of the two sites we set out to visit. The photographs Trina sent us earlier had me prepared, and wary. We had learnt many times before that photographs don’t always depict such ancient sites accurately, and to an certain degree this was the case yet again. To be honest I was a little underwhelmed; I expected something a touch grander and imposing. But that was how it began. Looking around on site, my ‘eyes’ started to become accustomed to the nuances and arrangements before us, and it soon became clear the positioning of rocks was unnatural. A platform with shaped rocks stacked atop measured about 40 metres (130 ft) in length and up to 5 metres (16 ft) in height. What became immediately apparent standing on the rock shelf in front of this structure was how incredibly flat and straight the entire platform is; horizontal planes support the many rocks placed above, and the vertical lines run very close to ninety degrees. It would not be unreasonable to propose that the rock ledge was originally close to being this (naturally) flat and level, and while it could possibly be the result of natural agency, the monument above it shows evidence of human hands and tools in its construction. However, what stands in between and above is most certainly not natural. The thin slab of rock leaning against the wall was uniform in width, not like the rocks nearby, and I suspected it was originally part of something bigger. I wasn’t sure of its place of origin – not until standing on the rock shelf, which probably also fell from above. What I saw was totally unexpected. Between the 40 metre wall and the rock boulder/ramp in front was a uniform gap of 10 centimetres, and this opening was sealed by a thin slab of granite, around 5 metres by 2 metres (16 x 6 ft). Both sides of the granite insert are 180 degrees, flat and smooth, and together form an almost perfect seal/join between the wall and the ramp. This rock veneer is most definitely of a different type of rock than that of the wall and ramp, and did not naturally shear away. While the technology and masonry skills apparent in this construction were not supposed to be in existence in Australia in ancient days, it would seem that this granite sheet was ‘made to order’ and specifically placed between the wall and ramp. And so our analysis began. My challenge was that after examining the rock joiner, my mind was already made up. I had prepared a list of tasks to conduct on site, amongst which measuring each rock and estimating its weight was a high priority. But not anymore; my first priority was to identify what was here, and still is. After climbing up for a closer inspection of the rocks and shining a torch between the first and second layers of rocks, I gave up fighting against the blatantly obvious. I made some attempt to delete thoughts of the granite insert and start again, remaining impartial and maintaining and objective focus, but it was a waste of time…. it was obvious this was an ancient complex. All the way along we could see in at least 40 centimetres and the space between remained constant, each rock fitted perfectly and each rock was shaped, chiselled and placed by humans. There was no other logical alternative; this complex was at least partly man-made. Nature does many miraculous things, but it does not chisel and stack four rocks, one on top of the other, in a manner that best supports the weight of the rocks below and above. There is too much seemingly intentional design at play here for natural agents to be responsible. Just left of the centre of the wall is a construct/formation that I feel is reminiscent of an altar. The area is recessed about 10 centimetres (4”) and features one arched rock that tapers to a peak. The two smaller rocks at the bottom were originally part of the larger rock and have split off some time in the past. The arch also supports rocks above that have been cut to fit. Throughout our brief inspection there remained one constant: up and down the rock-face there are too many straight lines and right angles to put down to chance. However, not every rock on this site runs in parallel lines. Two pyramid rocks were also found on the two flanks of this site, similar to those found at the Standing Stones and Adam’s Garden (Emu’s Nest) sites. The first was in situ, deliberately placed inside a small grotto-like stone lean-to. The pyramid rock serves no function as it bears no weight and stands alone. Even though it is now stationed in a protected location, it seems quite old and the stone very worn. In contradiction to the condition of the first pyramid rock, the second shaped rock was found exposed in the open yet has one side that is very sharp and is a far more dramatic specimen. I remember at the time that both Evan and Ryan were quite taken by this rock – and quite rightly so – but with so much to take in on this trip, Ryan’s memory of this specific artefact waned over the hours. The pyramid shape holds consistent on every side. All four faces are flat and totally lacking in percussion points or bulbs. Once again the absence of impact marks typical of rock-on-rock technology automatically rules out creation by an Original toolkit. The granite rock of this area is very hard, nothing like the softer grades of sandstone, and demands a hardness of blade that neither Original nor ancient Egyptian possessed. And given the finesse on display here, we have trouble accepting anything less than an iron chisel as a minimum base. To the left of the 40 meter construction, Mal found the remains of what could be an ancient wall, and one rock embedded in the ground that did look quite promising. Until dug out and removed to ascertain what the rest of the rock was facing and aligned to, it is yet another possibility. But with the certainty of what I believe is some sort of temple or shrine only 5 metres away, it is destined for further investigation on another day. It was time to move on to the next complex, and if I was initially a little underwhelmed by my first encounter, the second time around it was the complete opposite. Even now, I still have trouble accepting possible the implications of what we saw. For now though, there is still one task incomplete in this initial report; a concluding remark, summing up our opinions of the site that Trina so kindly took us to. We always work as a collective, on and off the field, and it is no different here. I asked the opinions of three of our group, all of whom had been on many expeditions looking at all types of archaeology. I did originally think about asking Mal and Bev, but I as this experience was unique to them I suspected that they may have little in comparative reference points, and that their opinions might therefore cloud the discussion. My questions were simple, or so I thought: Do you think there is evidence of human hands and tools at this site? And what percentage reflects your degree of certainty? Evan felt the “triangular rock” and “straight lines” established a compelling case. He also made note of “feelings” he sensed of an ancient presence, which for Evan, added up to a 90% chance of authenticity. Adam was convinced that the base platform was “made by nature” and what stood above “was assisted by man” who “worked with that place”. Absolutely sure of an ancient involvement, which he also intuitively sensed, I assumed this led to a “100%” assessment…. but with Adam, there are no numbers. The old paradigms can’t express the way he relates to the land, and he was not prepared to try to quantify it. Despite his sound philosophical objections, I’m putting him down as “100%” certain, although I will undoubtedly suffer the consequences when he reads this article. Ryan on the other hand was more pragmatic, and gave the site a ranking of 40% certainty. Although he conceded that he too “sensed use by ancient cultures”, he was correct in observing other formations where rocks had naturally splintered, albeit in diagonal, often jagged and erratic lines. But later that night, he called me outside to show me a photograph he had taken of the pyramid rock – he wanted to recast his vote. Ryan had forgotten about this rock and his initial infatuation with it, and although his vote had been taken, I allowed an informed revision upwards – as far as 70%. Despite his protests to raise the bar further, I was pleased to have someone in our immediate group seeking more evidence before making a judgement. While this may seem a secondary narrative, I believe it illustrates our team’s diversity, independence and balanced approach to our work. In my case, I was very much in sync with Adam’s explanations. There are too many straight lines, separate shaped blocks, and repetition of 90 and 180 degree angles in evidence. And of course, beneath this evidence is the granite insert between the wall and ramp. It is my belief that Trina has found an ancient temple, possibly even a shrine. And regardless of the site’s function, it is our collective contention that this sure-footed young woman has indeed discovered the remains of an ancient civilisation. In the following article (below), I will provide details of the second site shown to us that day – a far grander site with at least three separate areas of intriguing geometric rock structures and arrangements spread over a larger area, and which evidence a variety of construction techniques. More than once Trina assured us that the site she was leading us to would be waiting “just around the next bend”. Every hundred odd metres, the creek we followed through the dense bushland refused to run the straight and narrow and turned once again. From start to finish there were two constants on this expedition: the creek kept turning, and on the bed were hundreds of thousands of unstable rocks that provided our only passage forward. It was a minor inconvenience. Our team had already seen the 40 metre temple/shrine earlier that day, and if nothing else came of this trip, it had been a magnificent day regardless. The technology and masonry skills apparent in its construction were not supposed to be in existence in Australia in ancient days, and while there are still lingering questions of the site’s function, it is our collective contention that our sure-footed guide Trina had indeed discovered the remains of an ancient civilisation. All of our group came away more than satisfied that we had witnessed a new page of Australian history unfurling. (Read the full report here). Our party of nine had taken up their previous travelling positions; Adam was somewhere way up in front, Trina and Tina tried to leave the brakes on, staying with or near us as best they could despite our party’s sluggish pace – even in full flight.Bev had fallen earlier, and while I am pleased to say she has since made a full recovery, at that stage she decided discretion was the better part of valour and to go no further, taking position to await our return. Adam had already opened up his foot on the coarse grain, but it didn’t make any difference as he kept gliding over the rocks with his characteristic poise and pace. Up ahead, “just around the next bend”, were kilometres of the same rocks and the potential of something nearly as good, maybe better. As we neared the second site, a lusher stand and diversity of vegetation was now evident. The palms were taller and the hoop pines, still quite scrawny in comparison with those in our home territory, were getting a touch thicker in the trunk. We came upon a large still pool of water and some rather intriguing layers of rocks stationed in the water. Standing at the front, they held little attraction. It was possible this was all down to natural but unusual phenomena. The lines in the rock formations were not straight, but even so there was potential that some aspects of this structure were made by a human hand and tool. Nevertheless, after seeing the stone shrine earlier that day, and knowing that this was far less likely to have had human assistance, taking a couple of photographs then moving on to better pastures seemed the best plan of action. As we sighted the larger complex, I was somewhat bemused by my own ambivalence. This was a lot more like what I expected to see before my first encounter with the 40 metre shrine. It was much grander and spread over a larger area, with at least three separate areas of intriguing rock structures and arrangements. It also evidenced a variety of construction techniques, and appeared to involve less work with what nature provided and more man-made independent structures, weighing up to 10 tonnes. Yet despite ticking all the right boxes, I was initially more doubtful than the first time around. There was literally too much take in. The weight, scale of production and spread of possible archaeology we now surveyed was almost too good to be true. I needed to focus on one of the three areas of interest in order to assemble a measured assessment. I had a lot of trouble finding any geological explanation that could account for the left corner of a rock arrangement that spanned 10 metres. No natural agent could create this. Outside a hardened metal blade held by a person knowledgeable in the finer skills of masonry, no other explanation seemed feasible. The four bottom rocks met and touched at the corner, but were separate from each other and individually shaped and placed to support the weight of the rocks positioned above. For all intents and purposes, the size, techniques applied, shape, curved faces and gaps in between were almost an exact duplication of what we saw down the creek at the first site. However, there was one dramatic difference. It is highly likely that at the first site, the foundation shelf was already naturally in place before any rocks were stacked above. At the second site the base rocks were clearly cut and shaped then placed into position. The ‘ice’ was broken and I was beginning to ‘warm’ to the site. I now had firm evidence of what undoubtedly appeared to be the least imposing of the three arrangements/rock sites. Now was the time to step away and look elsewhere. Fifteen metres to the right is a distinct cube-shaped boulder that stands over 4 metres in height and must weight no less than 10 tonnes. The granite cube is clearly separate from the rock platform and the rock-face behind it. Shining our torch behind, beneath and in between, we saw a 5 centimetre vertical gap and one slightly narrower along the floor. Moreover, the colour, grain and contour of the rock is markedly different from both the platform and cliff face. If it cubic stone is of separate origins to its surrounds – as it most assuredly seems to be – with a sheer 5 metre stand of rock behind it, a pool of water in front and steep ledges either side, the logistics of moving this monolith onto the platform would be a complicated undertaking even using the best of today’s machinery and technology. But what only added to the mystery, in the gap to the right of the large cube rock wedged in the far right hand corner against the bottom of the cliff is a brown rectangular ‘brick’. The rest of the platform is flat and level with barely a rise detected. Why this oddly coloured rock was positioned here is another unknown issue. Perhaps a second slightly smaller rock sat alongside and snugly against the larger cube, still remaining in the centre, and this ‘brick’ acted as a wedge to secure what is no longer there. Or it could be yet another unusual piece of geology, because it certainly doesn’t match up with any other rock in the nearby vicinity. Continuing to the right about 20 metres past the boulder, on the other side of the creek, was a collection of rocks that seemed to have originally made up some form of rock arrangement. A rock leaning at a 45 degree angle and resting upon other rocks showed strong indications that it originally stood upright, and that considerable chiselling had occurred; the base certainly had the flat edge and capacity. The appearance of a second ‘cube rock’, much smaller but faithful to the same proportions, was either a recurring geological phenomena of the highest earthly rarity, or is the result of humans wielding chisels or something even more sophisticated. There are close to one hundred rocks that could be part of this arrangement. Many rocks have 90 degree angles and straight lines, and there appears to be a flat ramp formation leading from the rock platform into the creek. When viewed in context with the other two constructions (all within a 50 metre radius), form a strong circumstantial case that this was indeed an ancient complex. But as to what these rocks formed, nothing came to my mind or was suggested by others. We had trekked just over 3 hours up the creek, visited two sites and knew there were plenty more up “around the next bend”… or one soon after. When factoring in the time needed for the return trek, and the five hour drive that would follow, we knew we were running short on time. But there was one thing we now had in abundance, sunlight. The shadows of the trees had retreated as the sun rose, it was now just past midday and the sun was directly above. With the exception of Evan and myself, the team set off and waited for us back at the shrine in the shade, knowing that one of our party was at least an hour down the grey granite creek bed waiting alone. Trina and Tina were more than happy to continue – this really was their backyard, and for a while we were keen to follow, especially since our next destination was a fascinating rock that exhibited cuts, sharp edges and acute angles. It had been spoken of often during our walk in, and if this rock was close by we felt we should at least try. We went around one bend, then another, and our guide Trina was sure it was either the next one, or possibly the one after. After some time, we decided it was time to call it quits and head back. Next time around we could proceed further, but for now this was as far as we could proceed given time constraints and the present injury toll. With time for one last look at the 40 metre shrine, supplemented by the benefit of hindsight and up-stream comparisons, I became even more convinced of the ancient integrity of this site and the increasing likelihood that the second site was also a relic from the distant past. As we walked away I still remember questioning how nature could possibly create the rock arch that is so perfectly symmetrical. Each half is a mirror image of the other, and the chances that this was a purely random act of nature are incredibly remote. When considering whether these sites are the remains of an ancient civilisation, what needs to be remembered is that all the evidence isn’t in – not by a long shot. Trina has sent us many other photographs of sites we have not seen in the area. Apart from the severely cut rock that could be “just around the next bend”, we declined to look at several smaller sites along the way as time constraints focused our energy on the two sites I have described. Ahead were other sites Trina has seen, and further up the creek there are sections even she is yet to inspect. At this stage of our investigation, it would no doubt have been advisable to accept this as a work-in-process and withhold judgement until all the evidence is seen, mapped and measured. But it is too late for that. Whatever is still left unseen out there will not change our assessment of what we have already found. It is most certainly not natural, and was not created by any post-Invasion immigrant or variation of Original stick-and-stone technology. So what is left after ruling out the non-contenders? We can’t be specific but, in general terms, the answer has to include people in Australia in very ancient times using sophisticated technology that every history book denies could be so. Steven Strong is an Australian-based researcher, author and former high school teacher with a background in archaeology. He was involved in the formation of a Graduate Diploma of Aboriginal Education for the NSW Department of Education, writing units on Traditional Law and Contemporary History. He also co-authored the highly successful “Aboriginal Australia: A Language and Cultural kit” and has written over a dozen articles on Original history and lore for the National Indigenous Times, with four articles also appearing in New Dawn magazine. Together they have co-written 4 books: Constructing a New World Map, Mary Magdalene’s Dreaming, and Forgotten Origin (published by University Press of America) and their latest publication Shunned, which thoroughly refutes the Out-of-Africa theory of human history and examines the archaeological and DNA evidence that suggests Australia is where modern human beings derived. 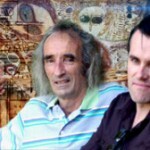 With close to 30 years of contact with original Gumilaroi people and tribes of the Bundjalung Language Confederation, and the benefit of extensive consultation with many Original Elders, Steve and Evan’s work is to reveal the ancient story of the Original people, a narrative that was almost lost to aggressive European colonisation.